This is South Side ARA's 3rd annual zine. This zine, just like the ones before it, is filled with intel on local fascists, action report backs and analysis. It represents a written documentation of the work we have done, supported, or taken interest in from mid-2011 to April of 2012. It's important that we recognize fascism as a component (or opponent) in the class struggle; it is a force that may influence the disenfranchised and those with potentially insurgent desires. They use populist, resurgent and nationalist politics in their attempts to sway people toward a world based on discipline, control, hierarchy and order. Those who reject the illusionary appeal of mainstream politics and capitalist wage slavery are the same people that we need in order to truly challenge capitalism and the state, towards a world based on freedom, creativity, and the fulfillment of our desires - reclaiming control of our lives and all the possibilities therein. 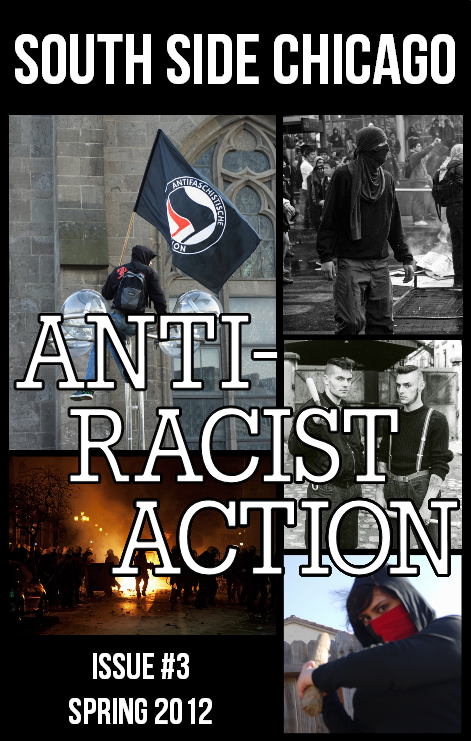 This zine is an attempt to not only document ARA's work, but to push others to analyze and understand fascism as a complex social movement, as well as think about the relevance of militant anti-fascism: an area of work less likely to be bogged down in reformist and liberal doctrine, being firmly rooted in practice as well as theory. We're fighting for a free society and a world without racists – and we intend to win.